A new company is hoping to help deal with "scooter infestation" around San Diego, as the amount of dockless scooters and bikes grow. 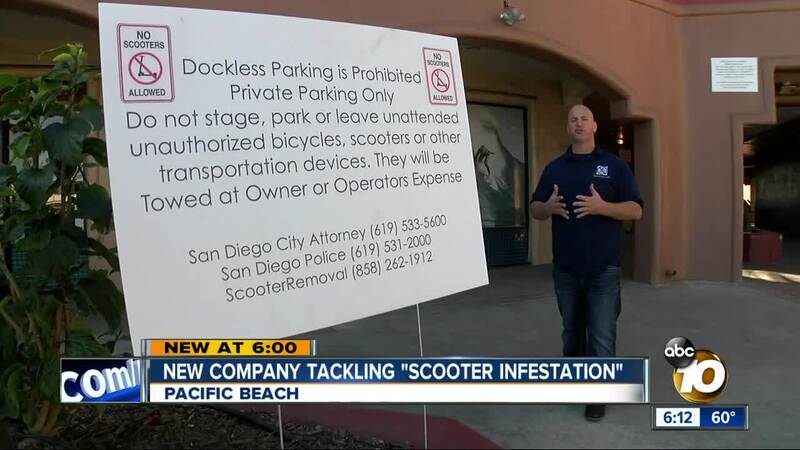 SAN DIEGO (KGTV) — Founders of a new scooter removal company are being hailed as heroes by some. Dan Borelli, one of the owners of Scooter Removal LLC , said he had been fed up with the devices for months. Borelli also owns a bike shop in Pacific Beach and was constantly dealing with scooters parked right outside his door. Finally he and a partner decided to do something about it. "When we sign up a new client they sign a towing authorization with our company, saying that we can remove the product from their property, legally," said Borelli. They initially give companies like Bird, Lime, and Uber a grace period to pick up the scooters before their company does. Once a scooter is removed it's securely stored and the company can pay a fee to retrieve it. Scooter LLC also asks that the companies put a "no parking zone" on the app in order to warn customers. Over the span of six months, Borelli says they removed 5,000 scooters from one Pacific Beach property alone. Ray Francis Polos, owner of Bella Ray Salon, owns one of the businesses at that property. “I really appreciate whatever he’s doing," said Polos, who's been frustrated with the scooters for the past year. He fears a customer will get hit by one. Borelli says they have around five clients and many more wanting to sign up. “Sometimes I feel like I’m in the military, they say 'thank you for your service,'" said Borelli. 10News reached out to several of the large scooter companies; Uber said it did not have a comment, Bird did not respond, and Lime said it would be sending a statement but had yet to do so at time of publication.